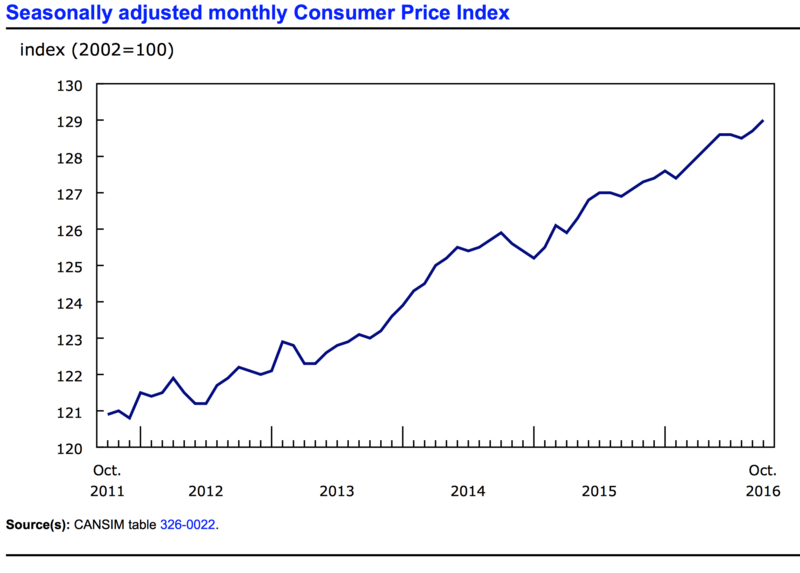 According to the report released today from Statistics Canada, The Consumer Price Index added 1.5% over the year ending in October, up from 1.3% in September. During the month of October, prices reportedly increased 0.2%, compared to 0.1% the previous month. With seasonal adjustments, the CPI increased 0.2% in both September and October. The Bank of Canada’s core index increased 1.7% over the year ending in October, down from 1.8% in September and continuing a trend of deceleration. 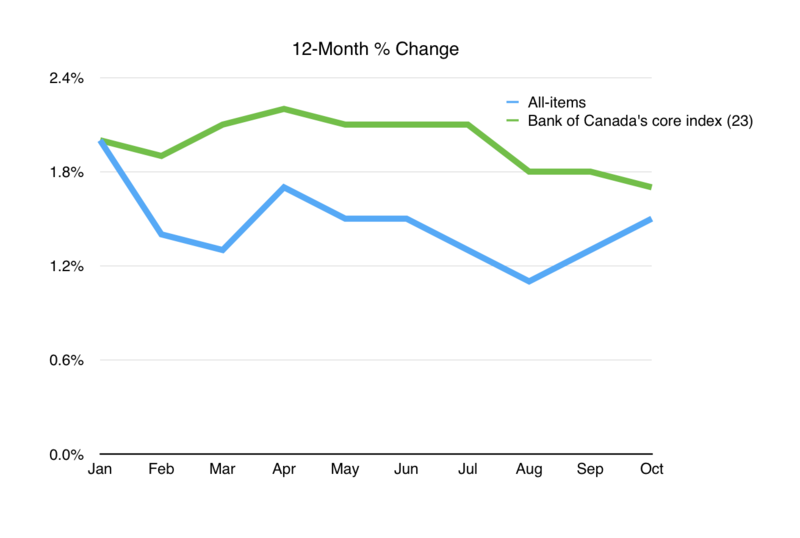 On a monthly basis, the core index was up 0.2% in both September and October. After seasonal adjustments, monthly core inflation was flat in October and up 0.1% in September. 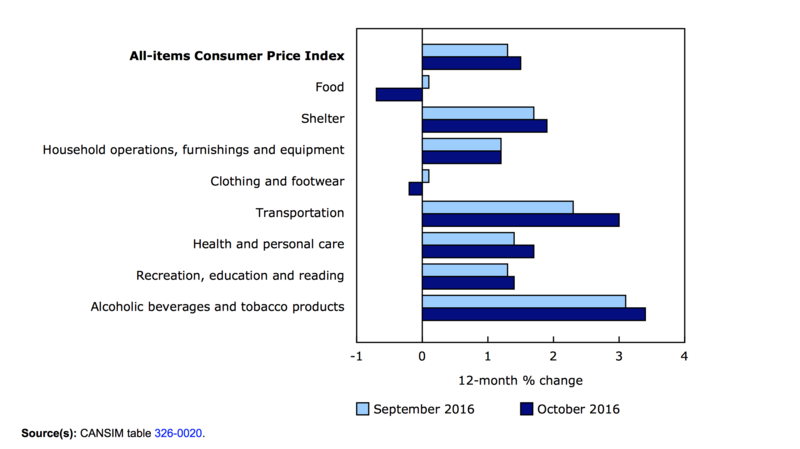 Transportation led the consumer price index higher in October, up 1.0%, largely because of a 3.7% monthly increase in gas prices. Shelter prices also bolstered inflation in the month, rising 0.5%. The index for health and personal care gained 0.3% in October and the clothing and footwear index climbed 0.7%. These gains were countered mostly by the falling price of food. The food index fell 0.4% to mark the third consecutive month of falling prices. The index for recreation, education and reading was lower in October, posting a 1.2% decline while the index for alcoholic beverages and tobacco products also declined 0.3% in the month. 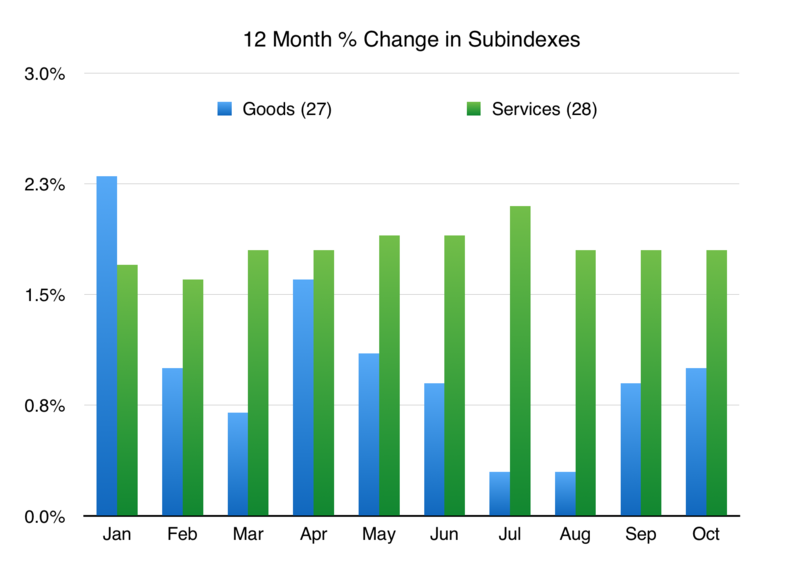 Interestingly, the subindex for goods climbed 0.4% in October while the subindex for services was unchanged. Each item in the CPI is classified as a good or a service; goods account for 46.7% of the all-items index and the remaining 53.3% is classified as services. The CPI is also divided into energy and non-energy subindexes, accounting for 7.8% and 92.2% respectively. In October, the energy index added 2% while the all-items excluding energy index only gained 0.1%. Over the year ending in October, inflation was driven by higher prices for transportation and shelter, up 3.0% and 1.9% respectively. The falling price of food created a major headwind to inflation over the year, as prices reportedly dropped 0.7%. Because food accounts for around 16.4% of the all-items index, the decline in prices shaved over 0.1% off the annual inflation rate in October. Until now, the food index has not declined on an annual basis since the year 2000. At the grocery store, prices slid significantly, down 2.1% in the 12 months to October. The index for food purchased from restaurants added 2.6% over the relevant year, following a 2.5% rise in September. The index for clothing and footwear was also down a marginal 0.2% year-over-year. The remaining components of the CPI pushed higher and generally saw growth accelerate on an annual basis in October. Acceleration in the transportation index was the result of gas prices reversing direction. Consumers paid 2.5% more at the pump year-over-year in October while prices in September were down 3.2% from a year earlier. At the same time, the shelter index posted its largest 12-month increase since January 2015. Within this index, the homeowners’ replacement cost index was up 4.1% and property taxes rose 2.8%. The natural gas index was down much less in October compared to September, 3.4% versus 11.1%. Over the past year, the price of services has grown more rapidly and more consistently than the price of goods. The chart below illustrates how the index for goods has consistently lagged the index for services and also been more volatile. In October, the services index added 1% year-over-year, while the index for goods was up 0.5%. Inflation has varied considerably across the provinces over the past year. Once again, Newfoundland and Labrador posted the highest annual rate in October at 4%. 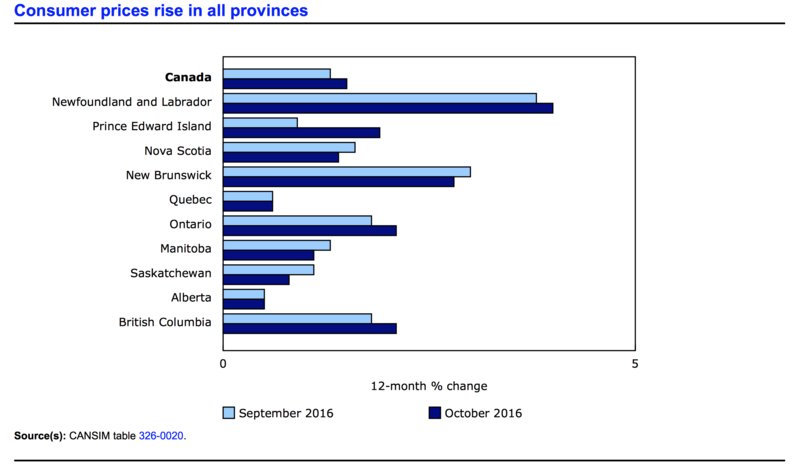 Alberta only saw prices rise 0.5% year-over-year in October, the lowest rate of the ten provinces for the second month. Prince Edward Island had significantly higher inflation than the rest of the country in October. The index for that province was up a monthly 1.0%. In PEI, an increase in provincial harmonized sales tax was implemented in October and pushed prices higher. Year-over-year basis, prices in PEI rose 1.9% in October following a 0.9% annual gain in September. Gasoline prices were also 4.7% higher in that province, verses a national average of 2.5%. Canadian markets were shaken by the results of the recent US election and assets are currently being reshuffled in both countries. Debt is being sold, bond prices are therefore falling and driving lending rates up. This week, Canadian banks have started announcing higher mortgage rates due to a declining supply of loanable funds. The Federal Reserve is also very likely to raise US rates next month. 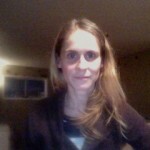 However, the bank of Canada is unlikely to follow suite. A rate cute is more likely in the cards in Canada to keep the Loonie’s value low and breath life into the sluggish export sector. This month’s inflation report was largely in line with expectations, only core prices were slightly below consensus. Still, annual inflation remains stubbornly below the Banks 2% target. Core inflation even appears to be slowing, which supports the case for a rate cut and for the canadian economy to operate independently from it’s neighbour.